Silence is golden -- except when a quiet news flow makes investors latch on to all the wrong signals that are driving rival stocks lower. What: Shares of big-screen movie technologist IMAX (NYSE:IMAX) fell 16.2% in August, according to data from S&P Capital IQ. The company had no terrifying news of its own to share during the month; IMAX shares simply followed in the footsteps of other stocks around the movie industry, dragged down by the digital movie streams pushing aside traditional distribution methods. So what: In early August, many movie studios and broadcasters reported slowing ad sales, lower viewership figures, disappointing next-quarter forecasts, or some combination of all three. IMAX was not among them, having reported downright impressive second-quarter results in the middle of July. That didn't stop investors from selling off IMAX shares alongside more vulnerable movie stocks. 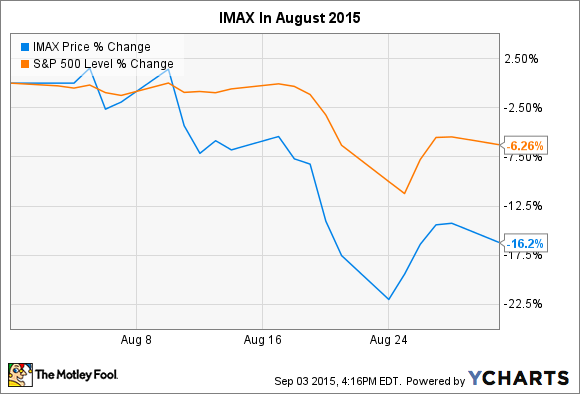 By the end of August, IMAX stock had retreated 28% from the all-time highs it notched in June. Now what: IMAX really didn't do anything to deserve this hasty retreat. The company is guilty by association with a movie industry that's struggling with new business methods. Digital streaming services are stealing eyeballs and ticket sales from traditional TV broadcasters and cinema chains; therefore, IMAX must be vulnerable to the same threat... right? Well, no, that's not right at all. The conventional movie-theater chains are struggling to convince film fans that their silver-screen services still are worth a drive to the theater, rising ticket prices, and pricey concession splurges. It's a hard sell compared to the high-def, big-screen TV right there in your living room, fed by low-cost subscription services and reasonably priced on-demand options right next to that fully stocked kitchen. They are trying many things, like lean-back theater seats, full-service dinner at the movies, alcohol licenses, and many other ideas. Some of this may actually work, but keeping consumers in the seats is still a constant struggle. IMAX has its own unique take on the whole movie experience, offering immersive big-screen experiences you won't find anywhere else. Sure, many theater chains have developed their own megascreen solutions, but those still don't have access to the specially shot IMAX content for the biggest blockbusters. And that cozy home theater doesn't even play in the same league when it comes to maximizing the impact of a high-octane action movie. 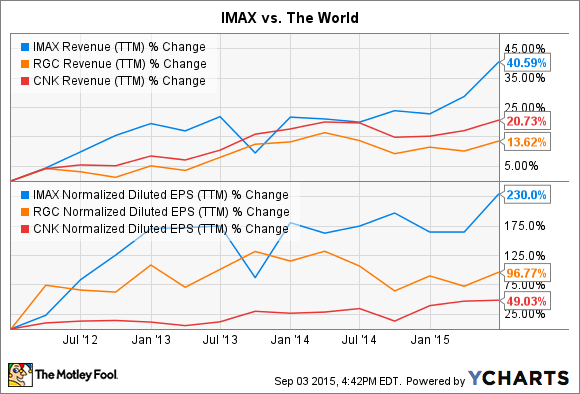 IMAX Revenue (TTM) data by YCharts. I don't think it's fair to give IMAX a haircut based on circumstantial evidence around the industry. This stock may have deserved a correction after racing 60% higher year over year, but this is definitely an overreaction.